Exactly how many words no longer mean the same thing they do when they were in use, before technology changes made them outdated? Who wants to start a podcast about the ever-evolving complexities of language? Voicemail: Howie Bell recommends The Blade Itself by Joe Abercrombie, and wants to know if there are any other fantasy novels that fall into the dark, gritty noir style, and we try to oblige. Listener Review: Web Genii gives us a review of Farthing by Jo Walton. 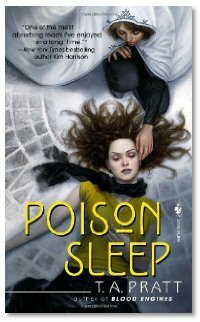 Listener Review: Chris Lester from Metamor City gives us a review of Poison Sleep by T. A. Pratt. The Library: New this week: Orcs by Stan Nichols; Jhegaala by Steven Brust; Pleasure Unbound by Larissa Ione; Mr. Fooster Traveling on a Whim by Tom Corwin.